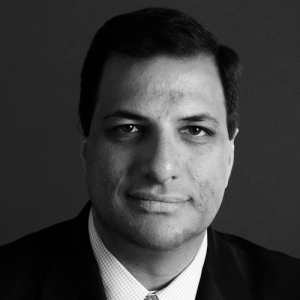 A question we get asked a lot is, “Why have many CEOs, executives, and entrepreneurs enrolled in Growth Institute’s Master of Business Dynamics (MBD)?” So I set out to investigate by talking to alumnus of the MBD. One of the alumnus I recently chatted with is Shannon Susko. Shannon Susko is a two-time best-selling author (The Metronome Effect and 3HAG WAY) and serial entrepreneur who is no stranger to being a CEO. After founding, building and successfully exiting two high-growth companies, she then went to coach seven $100 million companies that wanted her insights to help them grow bigger. Shannon’s decision to join our MBD surprised many of her friends and colleagues. After all, why would someone who held multiple graduate degrees along with 20 years experience building and leading high-growth technology companies in the financial services industry feel compelled to participate in the MBD program? What was in it for her? That’s exactly what you’re about to find out. Here’s a summary of my chat with Shannon. [Daniel Marcos] Tell us a little bit more about your entrepreneurial journey and how you got to where you are now? [Shannon Susko] First and foremost, I really see myself as a forever learner. It doesn’t matter that I’ve earned two undergrad degrees and one Masters degree and built two companies. The learning doesn’t stop with a degree, it doesn’t stop with selling a company. And I never stop learning. Learning was the biggest contributing factor to my growth as a really young CEO in my twenties. And as a CEO in my thirties and in my forties, learning continued to be a key factor to my success. [DM] It’s very interesting to hear that you built four companies. Can you let us know more about how learning played a role in helping you do that? [SS] Well, our first company, Paradata Systems Inc, took a little longer to grow and sell compared to the second company, Subserveo Inc. I spent 10 years growing Paradata Systems before selling it. When it came to Subserveo Inc, it took us just three years and three months to grow it and sell it. A lot of people ask me, did you just get lucky? And I said, we absolutely did NOT just get lucky. Learning was a key part of our success. We validated everything we learned from our first company to enter into our second company. [DM] What do you mean by validated? [SS] Well, when you’re building your first company, you’re learning on the go. We created the metronome growth framework - a practical framework for high growth companies out of all the business thought leader tools. When we founded our second company we absolutely validated our success from our first company and now exponentially in the second company by using the Metronome Growth Framework. 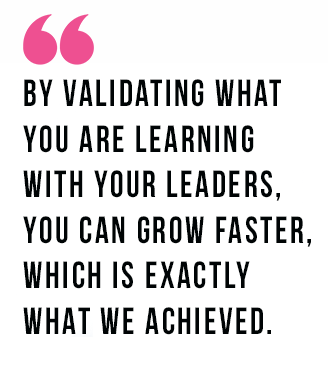 By validating what you are learning with your leaders, you can grow faster, which is exactly what we achieved. We were able to grow exponentially and sell our second company three times faster than the first and for 7 time ROI to shareholders. [DM] How did you go from building and selling companies, to becoming a coach? [SS] I continued moving forward with all the tools we learned from building the first two companies. This includes learning from many books and thought leaders such as Pat Lencioni, Jim Collins, Kaihan Krippendorff, Brad Smart, Verne Harnish and the Rockefeller Habits and then Scaling Up. Then, shortly after selling the second company, I got a great call from someone who knew my experience and they wanted me to coach them and learn the Metronome Growth Framework. Fast forward to today, I’m now coaching seven companies which average around $100 million dollars per year, and they want to grow much bigger than that. One of the key reasons why I'm still learning today and the reason why I'm still interested in learning is because I now have outlearn seven companies! It also means at times that I have to redo some of the learning I've done before because I’m now dealing with different companies in different situations. [DM] Awesome. So which program from the MBD had the greatest impact on you? [SS] In the end, the courses that had the biggest impact on me were the ones that really impacted my clients. First, it made me rethink what was going on in my business, but I then took the learning and insights to my clients to help them implement them as well.. In some cases I even recommended that my clients get involved and take that course as well. [DM] Great! Now, I've heard in the past that the MBD allows you to be a better leader because you're learning faster. Do you agree? Do you think the MBD helped you become a better leader? And did it help you raise your game as a coach too? [SS] Yes, absolutely! For me, as a coach, I need to lead the leaders. I'm working with outcomes. These courses really help me get those outcomes in a really methodical way. 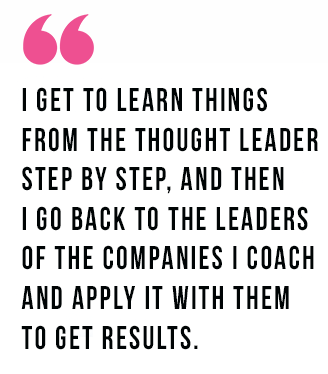 I get to learn things from the thought leader step by step, and then I go back to the leaders of the companies I coach and apply it with them to get results. It's really amazing. With the courses being online, it allows me to go back to the course material, even after I’ve taken the course. I get to look back and say, “Oh, I remember I did that.” And then I can pull that out when I’m walking in to that client meeting. I can prep for that client meeting because I know they need that outcome. So, I really don't think you can be a coach without this kind of program supporting you in the background. And it won’t just support you once while you’re taking it. It will support you all the way. [DM] Wow. Thank you for sharing that. Now, I’m curious. How would you describe the experience of taking the courses in the MBD? [SS] Taking the MBD courses was like a regular rhythm. It wasn't a one and done book. It wasn't a one and done workshop. I didn’t just listen to a thought leader speak for an hour. I’d listen to many thought leaders speaking for many hours. And the cool thing was, it was laid out very well. Everything in the MBD made me think harder. And I wasn’t just working on my coaching business for my homework. Sometimes, I would use my client businesses too. So by doing the program week over week, month over month, and then also having access to it afterwards made a huge difference. It wasn't like struggling to remember this idea or this framework that I heard at a growth summit two years ago. With the MBD, I get to apply the lessons and homework to my business and my client’s business as I’m doing it. Being able to access the materials after completing the course help me continue to support my business and my client’s. [DM] Was there any particular course in the MBD that sticks out to you as a lightbulb moment? Or perhaps a particular topic that made a huge shift for you or your clients in some way? [SS] Well, I’d have to say the negotiations course with Dr Victoria Medvec’s methodology. Maybe it's because I didn't know as much about her topic prior to starting the MBD. What I learned from that program sticks out to me because I’ve had to negotiate many, many deals -- both when it comes to selling my company and while running it. I found the High Stakes Negotiation framework so practical. I instantly took it and worked it in with all my clients. Now, I wasn't an expert in the framework, but the course allowed me to really break it down and help my clients actually negotiate better deals. I could leverage that framework so easily. There's just something about that course and the way it was laid out. All my clients have also watched and learned that framework. [DM] Thank you for sharing that. That was really huge value. Is there any advice you’d like to add for our community? [SS] Yeah. Never stop learning! I sort of laugh about it because I know everyone thinks I’m well educated. I have a business degree, I have a computer science degree, I have a master's degree. And most people go, “Why would you do the MBD”? Well, as a coach of many entrepreneurs, I highly recommended the MBD to coaches. I know lots of coaches have asked me why did I do it and how do I find time? Don’t let that scare you. After all, it's not like you do the MBD all at once. You just piecemeal it. Do it when you can. Just keep a good rhythm going and you’ll get through the courses. So absolutely, if you’re a coach, this will really help you. And also, for entrepreneurs. I seriously believe that you can't be an entrepreneur without a program like this. This is learning on your feet. It’s learning as you need it. And it's learning as stuff comes up. For me as a coach, I can help guide my clients through this. But even if your company doesn’t have a coach, you can still do this. Lots of leaders are coming in and learning through the MBD. The program works not only for the CEO. All the leaders of the company can do the MBD and you can all learn together. Teams that learn together, grow together. And they will end up where they want to be: very, very successful. [DM] Excellent advice. Thank you for the chat Shannon, and thank you for sharing your experience of the MBD with me and our community. If you’re looking to achieve exponential growth for your business, be sure to check out how Master of Business Dynamics can put you on the fast-track to success. 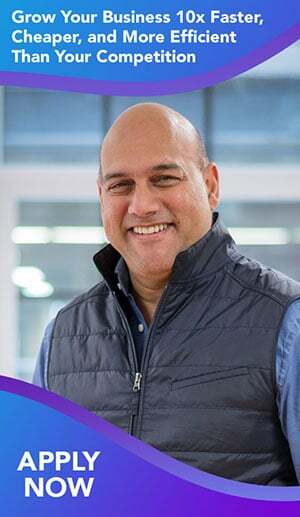 Master of Business Dynamics is an 18-month interactive online program that showcases Growth Institute’s best methodologies and access to top executives, coaches and entrepreneurs from around the world. It gives business leaders the tools and solutions to increase their company performance and efficiency under increased and expanding workloads. Click HERE to get more information about Master of Business Dynamics today.